Gary Brunton won his second Champion of Champions title of the season when he teamed up with Robert Wilde to win the Doubles title at Hataitai. In the final the Otaki clubmates beat Michael Rocks and Peter van Heusden (Khandallah). A reminder to those players competing in the National Doubles at the weekend that Saturday is election day. Polling booths are open from 9:00am to 7:00pm, so it may pay to cast a Special vote prior to Saturday, particularly if you are from outside the Kapiti region. A record sixty-two teams took part in the National Doubles Championship played at Kapiti over the weekend. Simon Faby (Herne Bay) and Georgio Vakauta (Victoria Park) were crowned Champions after they beat Christian Fouquet (Herne Bay) and Andre Noel (Victoria Park) in the final 13-7. Third place was shared by Nicola Brock (Kennedy Park)/Pam Jenkins (Herne Bay) and Maurice Belz (Napier)/Ron Sandilands (Cockle Bay). The Plate final was won by Pete Hamilton (Wanganui East)/Liz Rocks (Khandallah) who beat Monica Smiler (Park Avenue)/Nikki Winnie (Windy Hills). The Bowl was won by Bob Bridge (West End)/Bill Peachey (Hibiscus Coast) who beat Tony Chin/Ants Yee (Windy Hills). The Tournament Consolation was won by Erica Drake/Richard Lawson (Hataitai). The Women&apos;s Shooting competition was won by Christine Strichen (Wanganui East) over Sharon Cannon (Bay View) in a golden cochonnet shootout after the scores were tied in the competition proper. The Men&apos;s competition was won by Georgio Vakauta, with Andre Noel runner-up. PNZ founding member, Cam Calder is poised to become New Zealand's first Pétanque playing member of Parliament. A candidate on National's List, Cam is currently the 59th National MP in the House of Representatives. With Special Votes due to be counted by 22 November, it will be at least two weeks before we find out if National's share of the party vote is enough to secure his position. The Wellington team to play against Hawke's Bay in Palmerston North on Sunday 7 December is: Myles Cowper (Windy Hills), Peter Dennett (Hataitai), Barbara Johnston (Masterton), Sebastien Merval (Windy Hills), Graeme Morris (Masterton), Dean Norman (Windy Hills), Susan Norman (Windy Hills), Michael Rocks (Khandallah), Enoka Smiler (Park Avenue), Monica Smiler (Park Avenue), Peter van Heusden (Khandallah), Nikki Winnie (Windy Hills). Andy Gilbert has stepped down as National Director of Umpiring. The Wanganui East team of Ken Heywood, Shirley Selwyn and Nico Toyne won the Otaki Open Triples beating the Horowhenua combination of Rosemary Barrack, Ophir McDonald and Shona Whale in the final. The defending World Championship team of Thierry Grandet, Henri Lacroix, Bruno Leboursicaud and Philippe Schaud (France B) retained their title in emphatic fashion beating Thailand (Phukram Pakin, Sriboonpeng Sarawut, Piachan Suksan, and Phusa At Thaloengkiat) 13-0 in the final. Third place as shared by France A (Michel Loy, Pascal Milei, Zwonko Radnik and Stépane Robineau) and Belgium (Jean-Francios Hemon, Michel Masuy, Michel van Campenhout and Claudy Weibel). The Nations Cup was won by Spain who beat Sweden 13-10 in the final. Third place was shared by Benin and Burkino Faso. The Shooting competition was won by Abdel El Mankari (Morocco) who beat François Ndiaye (Senegal) in the final. In the semi-final Ndiaye set a new World Championship record of 64 points in beating Boureima Ouadraogo (Burkino Faso). The other semi-finalist was Pascal Milei (France). Results from the XII Asian Championships held in Taiwan earlier this month. Doubles: Thailand B 1; Thailand A 2; Vietnam A, Vietnam B 3 equal. Triples: Thailand B 1; Thailand A 2; Philippines A, Vietnam B 3 equal. Shooting: Pacharin Sanjumnai (Thailand) 1; Thongsri Thamakord (Thailand) 2; Nguyen Thi Hien (Vietnam), Vicki Heo Boon Huay (Singapore) 3 equal. Doubles: Thailand A 1; Vietnam A 2; Thailand B, Vietnam B 3 equal. Triples: Thailand B 1; Thailand A 2; Chinese Taipei B, Vietnam A 3 equal. Shooting: Sanya Phanphueak (Thailand) 1; Han Liqiang (China) 2; Thach Duong (Vietnam), Naoki Haraguchi (Japan) 3 equal. Cam Calder's stint as a National MP is now over following the counting of Special votes. Cam's place in the corridors of power has been reallocated to the Greens. 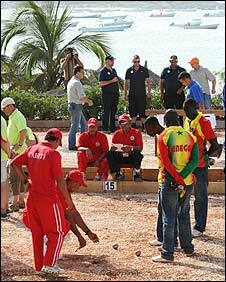 At this stage, it is not certain if any of the other members of Parliament are pétanque players. Ian Baker (Herne Bay) and Georgio Vakauta (Victoria Park) went one better than last year, when they teamed up with Andre Noel (Victoria Park) to win the Wanganui East Open Triples. In the final they beat Pam Jenkins (Herne Bay), Lee Taffard (Napier) and Nick Toyne (Wanganui East) 13-8. The Hawke's Bay team to play against Wellington in Palmerston North on Sunday 7 December is: Maurice Belz, Roberta Cambell, Sharon Cannon, Ian Hay, Marianne Hay, Simon Hurley, Barbara Lucas-Creigh, John Maxwell, Phillipa McNiven, Bethne Rouse, Lee Taffard, Robert Wilson. The Canterbury Red team of Les Clearwater, Jean-Pascal Cuer, Andrew Findlay, Jared Handford, Craig Mackenzie and John Targett won the inaugural Quadrangular tournament held in Christchurch. In second place was Wellington, followed by Canterbury Black and Southern.